Connect With FIC for a Day of Giving Back! We are in spired to give back and show our love of community on this global day of giving – November 27th. Since 2012, the #GivingTuesday global movement has kicked-off the charitable giving season by leveraging the power of collaboration and social media. 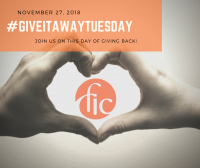 Join FIC while we give it away on our own day – #GiveItAwayTuesday! It’s our way to honor the spirit of giving and cooperation. Mark your calendar to be a part of #GiveItAwayTuesday and #GivingTuesday! ‘Like’ FIC on Facebook, mark yourself as ‘going’ to the event, and pin FIC to the top of your newsfeed to stay engaged throughout the day! Don’t forget to share the event with your friends! Think of ways that you can give back to your community! Capture the act in a picture, announce it in an #Unselfie, or shoot a short video. Have fun and let your spirit shine!